‘A Noble Pursuit’ is the title of a recently published book by Alan Armstrong on the life letters and works of Pipe Major John Grant, writes Dr Jack Taylor. Pipe Major Grant was the subject of a paper at the Piobaireachd Society conference given by Professor Armstrong in 2012, and the website http://pmjohngrant.com/wp/ has been current for some time. John Grant was the enormously productive composer of 64 piobaireachd, frequently dedicated to nobility, and he transcribed many more. His manuscripts are calligrographically and artistically outstanding. His compositions usually did not follow standard piobaireachd framework, and were rejected strongly because of that. Professor Armstrong, a cellist, choral conductor, bagpiper, pianist and with a PhD in Music History transcribes and gives his own musicological analysis of Grants compositions. He calls for a re-appraisal, and notes that very few of the tunes in the Piobaireachd Society’s Collection of Ceol Mor composed during the twentieth century follow “the rules”. He remarks that Kilberry, after professing “No-one can compose Piobaireachd nowadays” added his own work to the genre after Grant pubished The Royal Collection of Piobaireachd. Grant compiled but did not publish The Highland Bagpipe Instructor which Armstrong believes would have been one of the most ambitious and all-encompassing tutors on the market. His book “Pipes of War” co-authored with Sir Bruce Seton was highly respected. He was a poet, an artist, an autobiographer and the author of a novel The Silver Chanter the first part of which has been lost. Grant was one of piping’s obsessives. He was opinionated, wordy, zealous, and totally devoted. 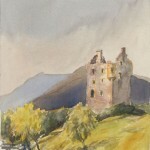 He was not a top performer in spite of being taught at Gordon Castle, Fochabers, by Ronald MacKenzie, a pupil of John Ban MacKenzie. He was the Piobaireachd Society’s instructor during WW1, John MacDonald being unavailable. He was dismissed in 1919 after a complaint by two pupils and was replaced by Willie Ross. He sparred on practice chanters with Pipe Major Willie Gray about the redundant A in the Oddfellows Hall, Edinburgh – Grant was in favour, Gray against. The piping establishment shunned Grant. He used the Piobaireachd “Drizzle on the Stone” as a teaching tool, taking his students outside and dropping water onto the pavement to show the effect. It is ironic that the recent film ‘MacCrimmon’s Gold’ highlights rippling water and a waterwheel to reflect R U Brown’s teaching. Grant deserves re-appraisal, and Professor Armstrong has provided us with this. Like Grant’s work, A Noble Pursuit is detailed, ordered and logical. It is is also balanced and academically rigorous – a true magnum opus. Its subject would undoubtedly approve of this worthy tribute to a dedicated servant of piping.